June is typically one of the sparkliest royal months in the United Kingdom, with Trooping the Colour, Garter Day, and Royal Ascot coming back-to-back. But this year, the recently-called elections will be changing a few things -- and not for the better where royal jewels are concerned! It was announced today that, because of the elections, the state opening of parliament has been moved to June 19. That was supposed to be Garter Day, but this year's service has been cancelled by the Queen so that she can attend the state opening. No parade of royals in their formal Garter attire at Windsor this June, sadly. 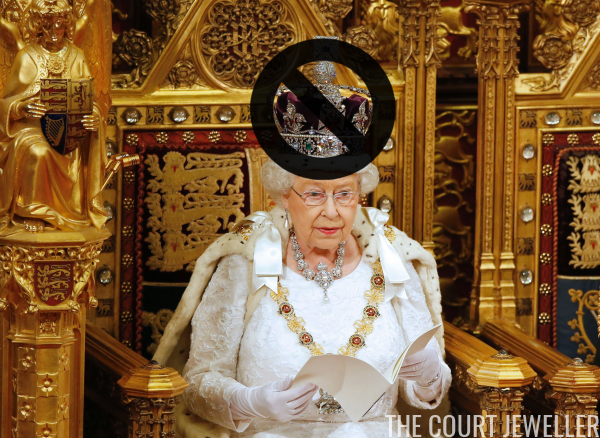 But it gets even worse for royal jewel lovers: because of the shuffle, the state opening will be noticeably less formal this year. The Queen will not wear her crown or her robes, and she'll be driven to parliament in a car, not a carriage. This kind of "dressed-down" state opening has happened before, but not since the 1970s. Unfortunately, it means we won't see the kind of pageantry and finery that we've come to expect from the event. So, bottom line: we'll likely see a hat and brooch at parliament on June 19, and we'll have to wait until next year to see the Garter knights and ladies at Windsor. What brooch do you hope HM will wear for the state opening? Something particularly grand, perhaps, to lend just a little bit of sparkle to a usually glittering occasion?